Just so much amazing stuff there One of the most original collections here. Now you've really got my attention. Abyssal Terrors are so Necrarch. I'll be watching! Fortunately I got my motivation back with double force! Unfortunately I couldn't find enough free time recently to make some use of it! Still, I managed to finish the ghost swarm of the Coven Throne and that was probably the worst part... I struggled a bit how to make metal and matte parts look different without clashing too much. In the end I painted ghost parts white and metal parts bright silver - and then glazed over it all with green and blue. The difference is there, but it's subtle, just like I needed it I added some white freehands on the ghost skeleton's clothes - those are the same models as black knights, they should have the same ornamentation as my knights. It's easy to miss if one doesn't know they're there, but that looks good on ghosts. In the meantime I am struggling to get a right shade on those bone railings on the carriage. @Borgnine Nicely executed all round. I like the minor difference between the spirit areas and the weapons, and the use of green AND blue as ethereal colours has made a really eye-catching swarm of spirits. That freehand pattern adds some nice focal points to the massive ethereal area too, and I really like the OSL on the base - did you take the glaze approach to this? It looks pretty tidy & realistic. You even hit the Wraith cloaks. That looks awesome, man! I think your Ethereal stuff is gunna look great spread around the army (Exibit A: your BSB). If the carriage is giving you fits, I painted mine metal. Maybe a chance to show off your armor corrosion technique on this model? @Farmer7574 My ghosts are blue on skin/bones and green everywhere else since my first undead miniature painted, but only here I managed to really bring it out As for the OSL, I use two methods. One is to start glazing a large are with Biel Tan Green and then while adding white to the mixture, glazing ever smaller area - at the source paint is much thicker and one gets a nice light gradient out of it. This works on flat areas. Thinner stuff like the fence I paint with white streaks before glazing - adding white where light hits the most - and then glazing it with Biel Tan Green, which blends the white a bit with the rest and also creating a gradient. @Adam_Barrow Thanks! But it seems I am running out of etherals in my army, as I'd rather mount my Mortis Engines on something more substantial, one that's easier to paint and doesn't need OSL We'll see how it'll turn out though. Also, thanks for the tip about the carriage, but it was done by the time you wrote that comment It makes sense to be bone and fits my color scheme a bit better. Also, this is a vampiric model, verdigris goes on wights their war statues. I got sick last two days - that meant not going to work and having lots of time to paint - and that made it possible to finish the carriage (well, almost) before going on a trip this weekend Besides spirits themselves and other special effects, this model is a one big excercise in following the red-black-white scheme for my vampires - and everything has to follow it. Even the materials that make up the carriage and pillows too - it was a bit demanding, but also fun and came out nicely. Curtains are not there because they'll be painted together with the girls. Going back to you OSL - I think the areas around the lanterns at the back and the flames on the carriage could really benefit from this, just a small tinge of the light's colour could add a lot. That said, it looks great as it is already and I'd personally probably not bother with it (since when you go down that route, you might end up having to do OSL on everything in the vicinity to make it look right). Your ethereals - How did you get that effect? It appears to be washes over a white basecoat, then a white highlight or is there more than meets the eye here? Superb stuff, keep it up! Very, very well painted indeed. I would say that you shouldn't change the pool's picture unless I knew you have what it takes to top that. The picture is very nice and creepy as it is. Needless to say, everything else is also executed perfectly. Keep it up buddy, your talent inspires us all. Surely this is your best yet? The cushions are great, the red marble is just perfect and the scrying bowl is.... I'm speechless. When you put this together with the spirit horde it might just break my mind! Amidst all that, there's the simple idea of the big sword lent against the back there, waiting to be used. That's one thing I can copy successfully! @Theerteen Love or hate, at least your emotions aren't lukewarm Thanks! @Farmer7574 I also never seen that, which seemed strange, it seems obvious after reading the description in the book. Then I found it's somehow difficult to do it right, so maybe that's the reason And I will be doing full OSL later, no worries - I just want to do it after I have all the girls on it. Two things to show today Second one goes into the next post for easier indexing. First, I remade the scrying pool. Earlier one was done quickly and without big preparation - and end result was rather flat. After that I designed the image on paper and spent two evenings working on it, instead of 1 hour. Painting the image itself was easy enough, but making the image clear AND adding shading+highlights on the surface was much more difficult. I couldn't get both strong enough at the same time, but this will work too. I was scrolling through ebay some day and I noticed some guy selling three carrions. Then I remembered an artwork I saw long time ago, which I wanted to recreate at some point. Those birdies were perfect for that, so I bought them and worked on them this last 1,5 week. I added those skull-like heads, some needle teeth and messed around their bellies a bit - and I think they turned out sufficiently creepy At this point it's all green and silver, but after painting all the features should be clearer. Waiting for all the GS to cure, I was doing some small progress on my Necrarch vampire and the dragon. And speaking of Necrarchs, I finally bought an Abyssal Terror 'Till next time! The scrying pool is great, and the converted carrions are... well, creepy. I will eagerly wait to see them painted! @Borgnine Great job on those carrion conversions, they're an excellent adaption of the artwork and a great example of a VC-themed TK unit. Your original work on the scrying pool was pretty darn good but the new version tops that. I can imagine painting a vision in a pool would be quite tricky as you're only able to paint on the surface but want to make it appear as though the image is inside the pool. Your later version comes across nicely and has more depth than it's predecessor. Top stuff, keep it comin! Do you happening to know where those models are from? They look nice. Can't wait to see them painted! Very looking forward to the end result! So cool and original! I finished painting the Flying Horrors - rather quick I think, even considering how troublesome all the parts on their wings were... Those are rather heavily converted Carrions from the now discountinued GW Tomb Kings range - I sculpted their heads from scratch, added some creepy finger and filled their bellies with tendrils and bodies. The general concept was inspired by this artwork. The mess in their bellies represents the first try of the visceral fleshcrafting I would like to add to one of my factions - think something like from The Thing. 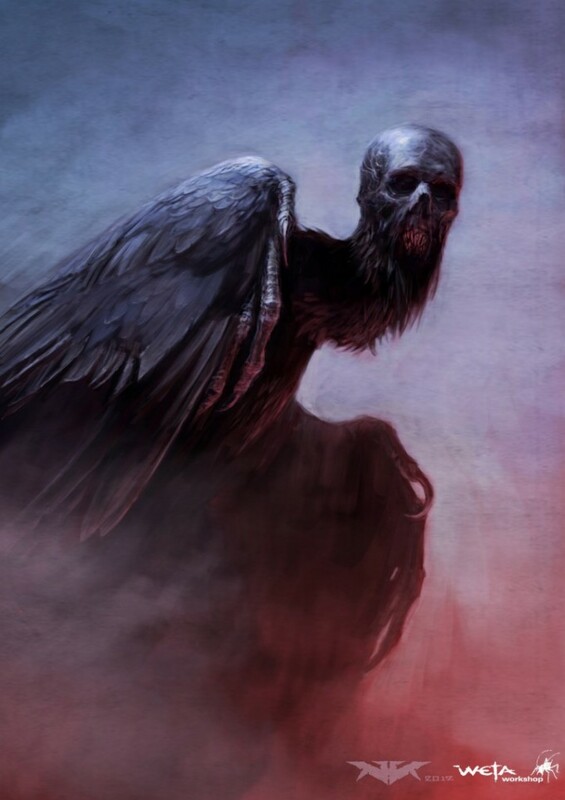 Built from strange varieties of bones, feathers and flesh, held together with steel and skin, the Flying Horrors are another mad creation of the flesh-stitcher Haralamb Gudvanger. What sets them apart from others, are their bellies - in which he planted seeds from the Lady of the Bog. Amongst all the dead, necromantic tissue molded by the stitcher, those writhing tendrils of the blooming flesh are the only living parts, twisted as they are. The hungry mass of viscera catches and consumes all nearby body parts - be they alive or dead - with unending appetite. As long as the Horrors won't devour themselves, Gudvanger can think of the experiment of joining dead mass with the living flesh as successful. When they are not fighting with wretches over waste bodies, they are useful in flesh-stitcher's modest force for scouting and terror tactics. Also, I brought here some Wights and seeing as I was making photos today, I decided to sit and remake some old photos to make them similar in style to the last ones (read: much clearer and overall better ) Upgraded stuff are the Vampire Brothers, Krell and Grave Guard together with Black Knights. And now that the competition is taken care of, I can go back to painting the Vampire Coven Throne girls and that Necrarch. @Borgnine These are stunning. The Thing is one of my favourite old-school movies and I've never seen anyone use it as inspiration for a mini. These are sick! Nice photos, all the detail shines through here in the finished mini shots. I especially like the mix of feathers & bone broken up with giant blobs of fleshy messiness. The hand stretching out is a nice touch too (I like the thought of using this on my next zombie ogre filler ). Great idea, great green stuffing and great painting! Looking forward to seeing those vampire ladies! I believe this is the border when we exit the realm of "painted minis" and we enter the "art". You truly obtained something impressive, here: the sculpting, the painting, the visual effects... the final result is staggering. After returning to their ancient homeland in Varsavia, von Greifens found themselves at odds with another vampire that rose to power during their long absence. A small, bloody court was held here by Lady Ecaterina Sokolov - once a wife of a Kislevite Boyar, now a vampire countess on the lands of Varsavia. Yet despite her pride, her position and forces seemed weak, which provoked brother’s attack. They came out victorious - only barely, though. She kept her own domain in which she still rules unquestionably, together with a personal army - and von Greifens were obliged to defend that land. In exchange, Brothers were free to govern and expand Varsavia as they liked. Before both parties concluded their meeting, the Countess shared a secret with the newcomers - information an ancient Varsavian death cult, which much later led to unraveling the story of wights and their Death God, changing the local balance of power forever. Ecaterina herself, when enraged by something personally, brings down her wrath from upon an exquisite throne loft upon by ancient spirits and accompanied by her two most loyal handmaidens. Amazing. I've run out of suitable superlatives for your work now. This makes my own Throne, which I'm really proud of, look about half finished! Instead of crying into my coffee about it, I'm going to try to take some inspiration from you. I'm making a list of things you've done on this model and I'm going to try them out on some future projects... one at a time, and on models that seem easily suited to it. You've gotta walk before you run!